Top: Mike Longacre, right, and Zach Longo hold some of their catch. Bottom: Zach Longo, left, and Mike Longacre show off trophies won by the ESF bass fishing team. Michael Longacre likes following his instincts. The junior aquatic and fisheries science major says he has gotten used to following his intuition as an avid bass fisherman who considers the sport his "passion and obsession." Longacre transferred to ESF last spring from a community college in Pennsylvania and promptly put those instincts to work. His first day on campus, Longacre said, he sensed that ESF might have attracted other ardent bass fishermen who would be interested in competitive fishing. "Just by what this school is about, I knew there would be other talented fishermen here," he said. Before the semester was over, Longacre had founded ESF's first competitive bass fishing team. The group quickly met with success. In their first few months as a team, ESF's fishermen have placed in the top three out of 50 or more teams in almost every tournament they've attended. 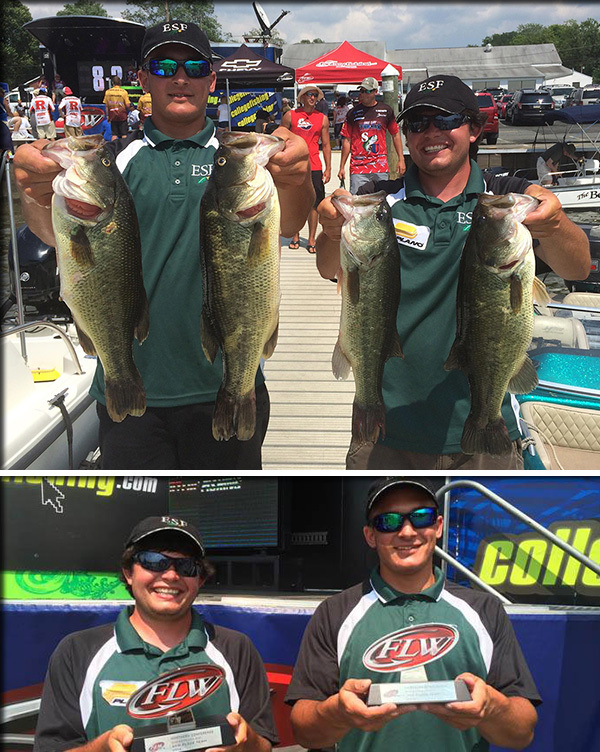 The group, which operates as an ESF club team, competes through the northern college division of the professional organization called Fishing League Worldwide (FLW). The ESF team has qualified to compete at an invitational in October that could lead to a spot in the FLW's College Fishing National Championship. "We are all very excited about the new ESF bass fishing team," said Daniel Ramin, ESF's coordinator of athletics. "As a college where most of the students participate in outdoor activities such as fishing, it's a great fit." Ramin said Longacre has shown strong leadership skills in promoting and organizing the team and the larger club that has grown to include more than 60 members. His first day on the ESF campus, Longacre proposed the fishing team to Ramin. After securing the sponsorship of the college and funding from the Office of Enrollment Management and Marketing, Longacre got to work putting up fliers around campus. Once he had assembled a group of students early last semester, the funding allowed the team to compete in the FLW College Fishing Northern Conference tournament on Smith Mountain Lake May 3, 2014. They placed third out of approximately 50 teams and took home a $500 prize, helping to reimburse the college for the initial investment. The team also won a $1,000 second-place prize at the College Fishing Northern Conference competition on Chesapeake Bay July 12. Competitive bass fishing performance is measured by the weight of the catch. In this event, the ESF team finished just one pound under the first-place winner, with a catch of 18 pounds, seven ounces. ESF's third tournament at Chautauqua Lake in August was not quite as successful, Longacre said. The team caught many fish that day but did not have a prize-winning weight. However, ESF's club still qualified to compete against 60 other teams in an Oct. 11 invitational on the Potomac River in Maryland. The top 10 teams at the invitational will advance to the 2015 FLW College Fishing National Tournament, with the chance to win a $30,000 prize and a new fishing boat. The team currently uses a boat that is owned by Longacre. "I think we've got a pretty good shot at it," Longacre said, adding that he has been fishing on the Potomac River in Maryland for the past four years during the fall. He also said that with the club's rapid growth, he sees more potential for future competitions. When Longacre first formed the team last semester, there were 25 students who attended meetings. Now there are more than 60. Longacre and other experienced fishermen usually choose the most-skilled members of the club to compete on the ESF team at competitions. The club currently meets once a week, at 4 p.m. Thursday for about an hour, in Marshall Auditorium. The meetings mainly consist of technique discussions and plans for future competitions. Longacre said he hopes to get the team out on the water more for practices, especially to give novice anglers a sense of what it's like, if funding and scheduling allow. "It's probably 5 percent luck and 95 percent skill, knowledge, and instinct," Longacre said. He added it is key to know how fish behave in each season, whether they will be actively looking for food or seeking cover. However, he also said every day on the water can be different. Longacre plans to have accomplished bass fishing competitors come and talk to the club as guest speakers. One of the first speakers will be Robert Goffredo, who won the Wal-Mart Northeast Bass Fishing League tournament this past summer. Goffredo owns a bait and tackle shop on Oneida Lake, called Bartel Road Bait and Tackle, in Brewerton, N.Y.
Goffredo said ESF is fortunate to have natural lakes for the team to practice on. "There is so much unbelievable water," Goffredo said. "The pros want to come here." New York is considered one of the top 10 best fishing states in the country and ESF is just an hour's drive from many of the best bass fishing lakes in the state, such as Oneida, Onondaga, Cayuga and Ontario, Goffredo said. He also said he appreciates how the ESF bass fishing team is bringing awareness to the sport, noting that ESF supports the sport's focus on sustainability. Bass fishing is conservation driven, with guidelines for catch-and-release fishing to take care of the resource for future generations, Goffredo said. "I love this program," he added. "I think the students have the future right in front of them."